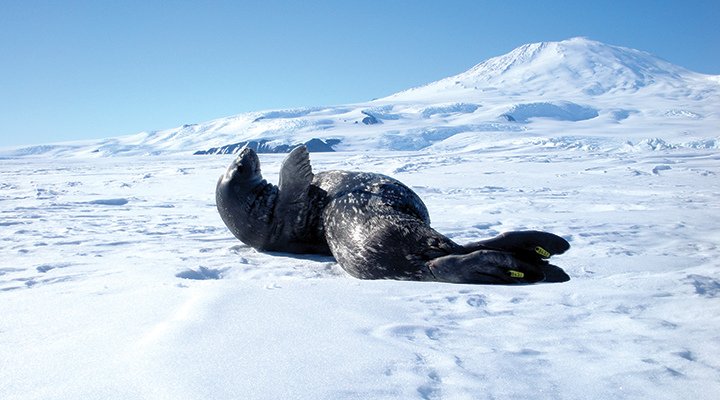 Cal Poly researchers travel to Antarctica to solve the mystery of the Weddell seal pup's dive. An aircraft comes to a halt on a runway constructed on a massive ice sheet at the bottom of the world. A team of Cal Poly biology researchers emerges to witness the world’s largest frozen desert and Mount Erebus, an active volcano, steaming in the distance. The researchers travel for an hour in a custom heavy-duty vehicle designed to operate on the icy road of compacted snow that leads to McMurdo Station, Antarctica. The largest Antarctic station, McMurdo serves as the primary logistical hub for half of the continent. The sprawling facility is built on the bare volcanic rock of Hut Point Peninsula on Ross Island, the most southern solid ground in the world, which is accessible by ship only during the summer months of December through February. The Cal Poly team consists of biology professors Heather Liwanag and Lars Tomanek, graduate student Emma Weitzner, post-doc Linnea Pearson and Sophie Whoriskey, a marine mammal veterinarian. 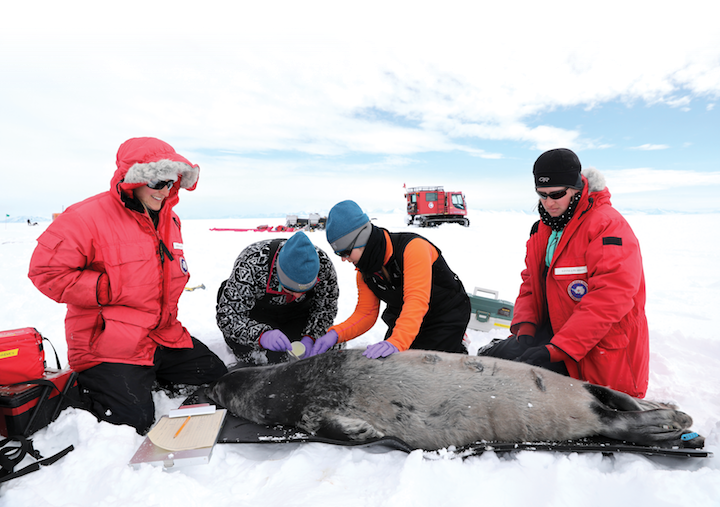 They’ve come to the frigid south for a 10-week research expedition to investigate Weddell seals, the southernmost breeding mammals on Earth. 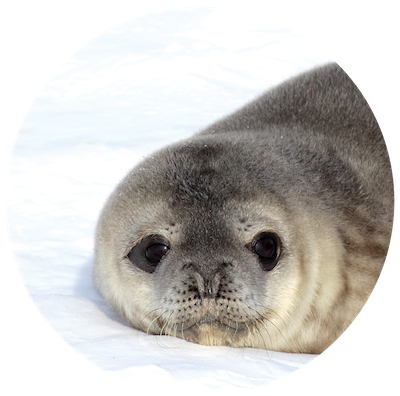 In only a few weeks, Weddell seal pups develop the ability to maintain a steady body temperature both on top of the sea ice and within the 28-degree seawater where they forage for food. The Weddell seal can dive to depths of 2,000 feet and stay under for up to 90 minutes. They can grow to 10 feet and weigh about 1,000 pounds, and in the wild they can live up to 30 years. Pregnant females usually give birth to one pup in October or November — spring in the Southern Hemisphere. These young are silver or light brown — their parents are spotted gray and black — and can swim by two weeks of age. THOSE PUPS ARE DARN CUTE, BUT DON’T UNDERESTIMATE HOW TOUGH THEY ARE. Thanks to a National Science Foundation grant, the researchers intend to solve the mystery of how the young pups maintain their internal temperature in this extreme environment. The way seal pups stay warm in polar environments varies across species, and scientists don’t know yet what mechanism Weddell seals use. To learn how these pups become master divers, the team typically spent 8-12 hours on the sea ice gathering data. Once located, pups were tagged with time-depth recording devices. Blood and muscle samples were then collected from one group of pups and metabolic rates recorded from a second group. This data will later be compared to the animals’ dive behavior in hopes of discovering how they store oxygen in their early development. 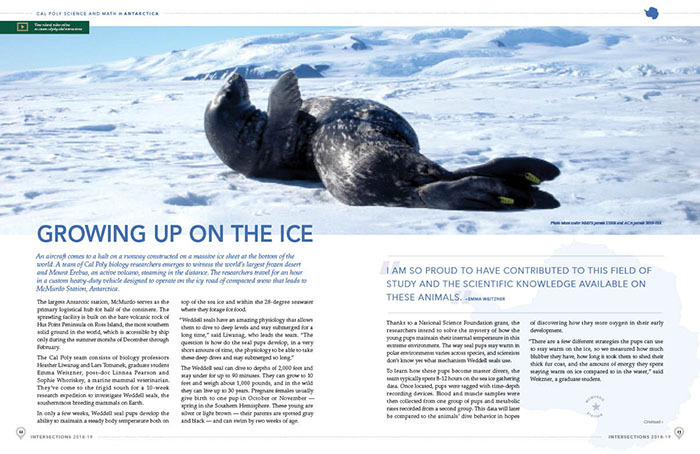 “There are a few different strategies the pups can use to stay warm on the ice, so we measured how much blubber they have, how long it took them to shed their thick fur coat, and the amount of energy they spent staying warm on ice compared to in the water,” said Weitzner, a graduate student. Though the team planned procedures meticulously to ensure the safety of all researchers and animals, field work is not always predictable, especially in such an extreme climate. Tomanek described an experience when a particularly concerned mother seal nicknamed “Momzilla” pushed the researchers within feet of the frigid waters during an observation procedure. Despite the challenges, the opportunity to learn about these amazing animals continues to inspire the team. Much is known about Weddell seal adults, but little is known about how the young pups develop into one of the world’s most resilient mammals and best marine-divers. The data the team collected will help change that. Cal Poly researchers attach a VHF radio tag to a Weddell seal pup in McMurdo Sound, Antarctica. From left to right: Sophie Whoriskey, field veterinarian with the Marine Mammal Center; Emma Weitzner, Cal Poly graduate student; Professor Heather Liwanag; and Linnea Pearson, Cal Poly postdoctoral researcher. Photo credit: Lars Tomanek. All photos of seals taken under NMFS permit 21006 and ACA permit 2018-013.